Undoubtedly, these graduates are glad to be done with school. After 12 years of compulsory education, they are finally getting out. They have served their time. And the value of that public education is more in question than ever, particularly for anyone who bothered to read their diploma. 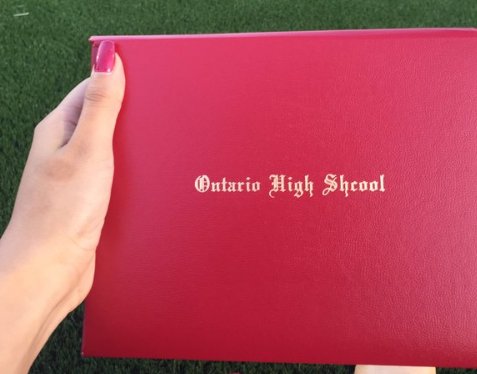 Recently, students at Ontario High School in California graduated and proudly received their hard-earned diplomas. Yes, a @$%&ing spelling error at the institution entrusted to rear these impressionable developing minds. According to KTLA5, the school blamed the issue on a graduation products company “printing error”… which apparently no one at the school caught while they were stuffing 550 diplomas into them. While it may be a minor error, it certainly raises questions about the quality of their schooling. At least the students were quick to catch it. The district, close to the Los Angeles area, didn’t actually respond until the seniors began posting pictures of their diplomas on Twitter. Students have been assured they will receive a new, correctly spelled diploma complete with an apology letter. Sorry that you were forced to endure this indoctrination center for such a large portion of your lives. However, despite what some believe, the dumbing down has been more intentional than happenstance. In short, the decline was engineered. The Marxists who took over the education system were more interested in obedient citizens than in thinking young adultsWelcome to the Idiocracy! We apologize for overlooking basic spelling, but what did you expect? Hopefully, it will be a lesson you remember with bitter irony as you enter a workforce with shrinking job prospects, staggering student loans that will ensure you remain in debt for the rest of your lives (should you choose to go to college) and a rising cost of living that makes the American Dream a farce that only the sadist dare to latch onto. Good luck and thanks for the property taxes paid by your parents! Welcome to the future, Class of 2016!